Firefighters rushed in, looking for whatever they could grab and carry to safety, according to accounts by Paris officials and French media. Firefighters rushed in, looking for whatever they could grab and carry to safety, according to accounts by Paris officials and French media. The fire department chaplain - his glasses reflecting the orange flames - demanded to join them. Then a human chain took shape, Paris' deputy mayor for tourism and sports, Jean-Francois Martins, told "CBS This Morning." It included Parisian officials, church caretakers, and the Rev. Jean-Marc Fournier, the fire chaplain who, hours earlier, had been preparing events for Easter week. "We have avoided a complete disaster," said Maxime Cumunel, secretary general of France's Observatory for Religious Heritage. But he told the Reuters news agency that perhaps "5 to 10% of the artwork has probably been destroyed." "We have to face up to that," he said. Among the items they salvaged, said French Culture Minister Franck Riester, was the crown of thorns that many worshippers believe was worn by Jesus before his crucifixion. Also recovered was a tunic once donned by Saint Louis in the 13th century - while Notre Dame was being built. Both of those items are now in safekeeping at Paris cty hall nearby, and would ultimately join a convoy others soon to be taken to the Louvre Museum, Riester announced. Etienne Loraillre, the editor of France's KTO Catholic television network, said the chaplain Fournier had a key role in saving the crown of thorns and other items. Fornier had been a military chaplain who served in Afghanistan, and in 2015 comforted survivors after a rampage at the Bataclan theater and northern Paris in which 130 people were killed. 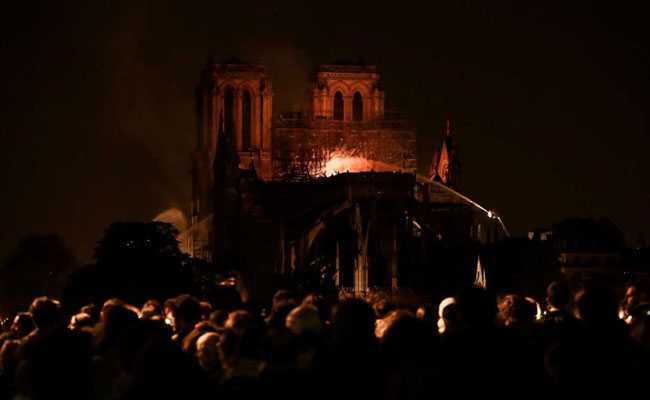 Fortunately, Notre Dame was nearly empty when disaster struck. A fire alarm was first triggered at 6:20 p.m. Monday, but security officials at the cathedral could not locate a blaze. To be on the safe side, though, the cathedral called off an evening Mass and evacuated the complex. Twenty-three minutes later, flames were visible - high in the building's ancient wooden frame. In another twist of good fortune amid the ruins, 19th century copper statues of the Twelve Apostles and four other biblical figures had been removed by crane from Notre Dame last week to be cleaned as part of an overall restoration project at the cathedral. Other immovable pieces that made it through the flames - such as the 8,000-pipe organ originally built in 1403 - will be carefully assessed in place for water damage. The tally of what was lost, however, is already profound. It includes fragments of the remains of Saint Genevieve and Saint Denis, portions of which were installed in 1935 in architect Eugene Emmanuel Viollet-le-Duc's 19th-century spire, which collapsed at the height of Monday's blaze. Historians emphasized that the cathedral itself was an emblem - and even a crucible - for a certain architectural style and the advancements that came with it. Notre Dame was perhaps the iconic gothic aspiration, said Samantha Herrick, a historian of medieval France. For the moment, the most pressing question is the state of the cathedral's sprawling stained glass masterpieces - and particularly the three massive, multicolored rose windows originally installed in the 13th century and heavily restored 600 years later. Despite these subsequent restorations, the windows still contain some of their original medieval elements. For experts, what makes the monumental rose windows installed in the course of this construction unique is that there are few examples of medieval stained glass in Paris, at least outside of Sainte-Chappelle, a jewel box of a chapel in the shadow of Notre Dame on the Ilede la Cite. Late Monday, President Emmanuel Macron called for Notre Dame to be rebuilt. And almost immediately, some of France's wealthiest families pledged their support. Bernaud Arnault, Europe's richest man and the chief executive of the LVMH luxury conglomerate, pledged 200 million euros ($225.7 million); Francois Pinault, another luxury magnate, pledged 100 million euros.